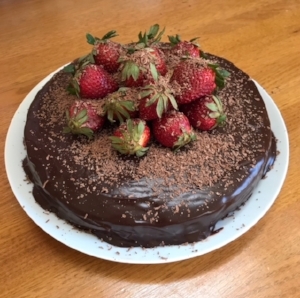 This flourless chocolate cake was definitely a crowd pleaser! Step 1: Preheat oven to 180C. Grease and line the base and sides of a 22cm square cake pan with baking paper. Step 2: Combine the chocolate, butter, cocoa powder and 1/3 cup (80ml) water in a medium saucepan over low heat. Cook, stirring, for 3 mins or until mixture is smooth. Transfer to a large bowl. Add the egg yolks, sugar and almond meal and stir to combine. Step 3: Use an electric mixer to whisk the egg whites in a clean, dry bowl until soft peaks form. Add half of the egg white to the chocolate mixture and use a large metal spoon to gently fold to combine. Add the remaining egg white and gently fold to combine. Pour into the prepared pan. Bake for 45-60 mins or until a skewer inserted in the centre comes out clean. Set aside to cool completely. Step 4: Make Chocolate icing: Place chocolate and cream in a saucepan over low heat. Cook, stirring constantly, for 3 to 4 minutes or until smooth. Step 5: Turn cooled cake onto serving platter. Spread icing over top and side of cake. Stand for 10 minutes or until icing has set. Top with fresh strawberries and sprinkle with grated chocolate. Thanks to Taste.com for the recipe.